Prior to 1752, Blowing Rock, North Carolina, was initially inhabited by Cherokee and Catawba Native American Tribes. These tribes were the ones to give “Blowing Rock,” a peculiar rock formation jutting from the mountainside, its backstory and title. Legend has it that a Chickasaw maiden journeyed from the plains to the Blue Ridge Mountains. While resting on the rocky cliffs (now Blowing Rock) to admire the view, she saw a handsome Cherokee Brave in the woods below. To gain his attention, she shot a flirtatious arrow in his direction, immediately winning his affection. 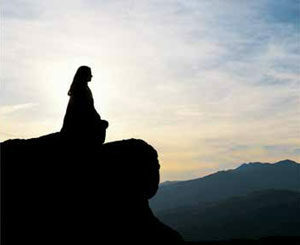 The two became lovers and would often sit on the rocks to look over the mountains. That is, until one day the sky became a deep red, an omen of troubled times and a warning. The brave felt the call of duty to return to his tribe, but his love begged him not to go. Torn between both of his loyalties- the Cherokee Brave leaped from the craggy rocks. Grief-stricken, the young Chickasaw woman prayed to the Great Spirit for his return every day. Her prayers were finally answered when the skies again, turned a dark red. It was then that a burst of wind came barreling up the cliff side, and in its power- carrying the Cherokee Brave back to the arms of his love. The winds have been blowing ever since. 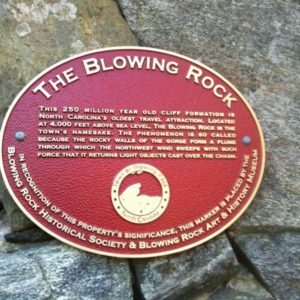 Today The Blowing Rock is North Carolina’s oldest attraction, since the park’s inception in 1933. You can see all of the great events being hosted by The Blowing Rock on Vincent Properties’ Living in the High Country page. You can also visit www.TheBlowingRock.com for more information on what makes The Blowing Rock, North Carolina such an excellent place for your next visit!